You can use the form below to send in your nominations. It shall be online from the 3rd to the 20th October inclusive. It’s always sad writing about a musical talent that has left us too soon. It’s extra sad when that person is younger than you and devastating when that person is a good friend. The passing of Cork DJ and singer John Brosnan on Friday has left Cork in shock, as he was one of the most popular and infectious figures on the music scene. He will be sadly missed by everyone who has had the good fortune to cross paths with him and I’d like to celebrate his life a little here today. Broz and Angi were partners in life and have always been synonymous with each other. Back in 1995 I was first introduced to them by the Joe and Denis who were promoting Mór Disco, and we all became friends immediately. The years rolled by and many great shows and adventures were had here and all over Ireland and the UK. After leaving for Holland at one stage, the two returned here earlier this year much to the delight of their many friends and acquaintances in Cork. Both were DJs, but unlike myself and Angi, Broz was a singer and it was in this field where he really established his reputation. From the days of fronting soul and disco outfit Sexual Chocolate and tearing the roof off venues such as the Opera House right up to his live singing at the legendary night Workout, Broz was someone who was born to entertain. Even when not working, he was the life and soul of the party in Cork and he spent the last night I met him last week dancing in front of me singing every song at a gig in the Woodford. 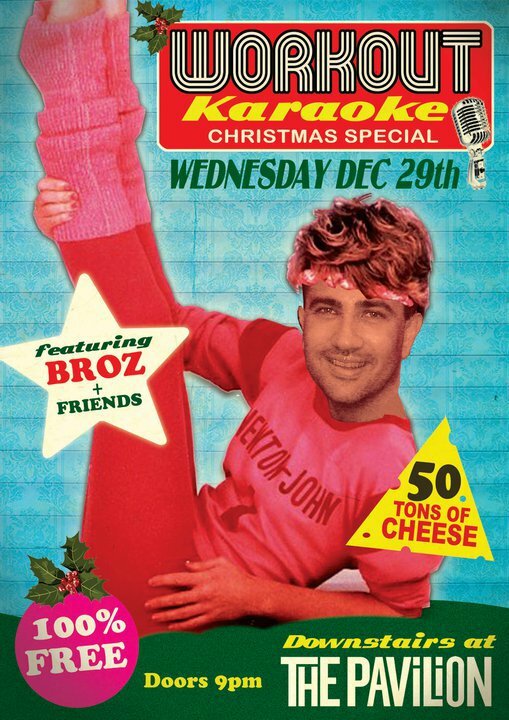 He simply loved music of all kinds and whether it was Karaoke bars, gay bars or super pubs, no mic was safe and Broz was always willing to bring us joy at any time. Sometimes the gay scene in Cork, which has always been very important in this city, is left at the margins and not documented. Through nights like Mór Disco and Workout and many more, I’ll certainly never underestimate it’s impact, and these and other nights were also good in creating a tolerance and understanding that sometimes can be taken for granted. Thankfully, Cork is very much an enlightened place in 2011 and I think its fair to say the sheer force of personality from Broz has helped this too. Music has always been a powerful weapon in breaking down all prejudices and with the likes of Broz bringing the music, we were always guaranteed a great party. With all the journalistic talk of music genres and technical jargon, we sometimes forget that music is simply an expression of emotions and a celebration and during this week and beyond we will celebrate John Brosnan. 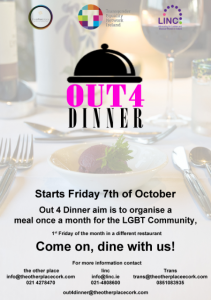 Out 4 Dinner is a new Dining group for the Cork LGBT Community. 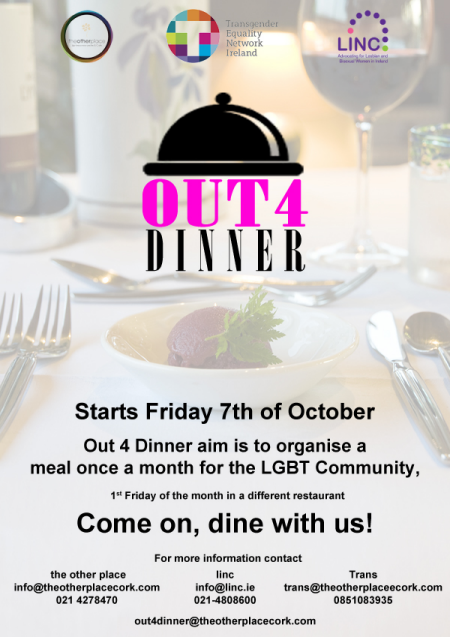 Their aim is to organise a meal on the first Friday of every month. For more info see the above poster. 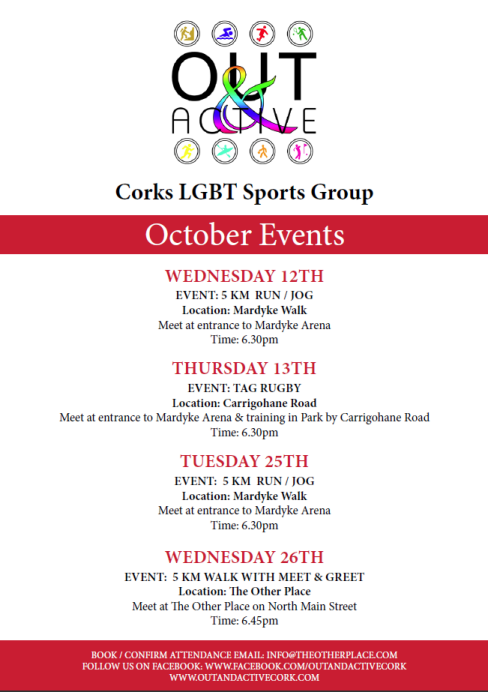 Out & Active, Cork’s LGBT Sports Group have released their October Schedule. 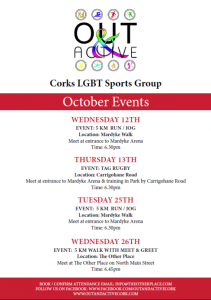 Wed. 10/12 6:30 PM 5 KM Run / JogMeet at the entrance to the Mardyke Arena. Please wear correct shoes and also Hi Vis jacket. Tue. 10/25 6:30 PM 5 KM Run / JogMeet at the entrance to the Mardyke Arena (map) Please wear correct shoes and also Hi Vis jacket. 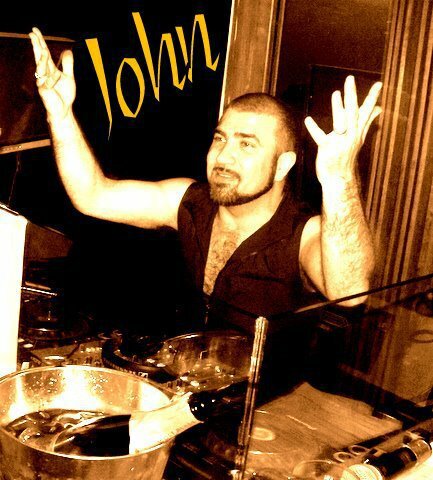 The Cork LGBT community has lost a legend, when sadly DJ John Broz, passed away on September the 30th. He had been an integral part of the cork scene long before there was any mainstream gay pubs in the city, with his regular Sunday nighst in the Savoy and also regular spots in the Roundy, Loafers and the Other Place. Once upon a time there was a DJ who liked it big, brash and utterly cheesy. He wanted to bring heaven in a handbag to the people of Cork, so he teamed up with a friend and turned the city’s most famous venue into one of the best gay clubs the nation of Ireland has ever seen. But then the nasty forces of the baying heterosexual market forced our hero out on his ear and although he tried to resurrect the magic in another venue, it just wasn’t the same. That club, for those of you not in the know (shame on you!) was called Work Out and for one all-too-short year it packed queers by the thousand into the environs of Cork’s Savoy Theatre and fed them on a delirious diet of diva pop and sequins, the like of which the People’s Republic had never quite experienced before. The DJ who supplied the sugar was called John Broz, and although he was already a wellknown player on Cork’s scene, Work Out gave him the chance to stretch his beautiful butterfly wings and show the city exactly what he was made off. Work Out was the original concept of a friend of John’s called Joe Kelly. Broz takes up the story: “Joe came up with the idea of doing it at the Savoy and he asked me if I would do it. I was like, ‘Of course!’ Give a gay man a stage that big, and he’s going to say no? “It started off as a straight/gay mix, but it got really gay very quickly. Over a thousand people would turn up and I’d have things like Wonder Woman on the screens, and I’d wear legwarmers and shorts, the whole Kids from Fame thing going on. I’d play anything from Guns ‘n’ Roses to Shirley Bassey, and everything in between. We did calendars up for the year, with my head on Wonder Woman and John Travolta, and all of the Nolan Sisters! It was outrageously camp. Work Out got huge very quickly. We had ‘80s legends like Jimmy Somerville over, we had Limahl… Adeeva was booked but she never turned up. I was furious over that! She was in Paris and she missed that Chunnel thing. I was like, ‘She couldn’t fly?’ She was coming to Cork by train and boat! So the pair decided to move to Amsterdam, where the gay livin’ is easy. Two years later they’re thriving in the Dutch capital and have just bought their dream house on an island north of the city. But John’s beginning to get itchy feet. “I’d love to DJ over here,” he says, “but it’s very difficult to get into. It’s a closed circuit and it’s very hard to break. Now that we’re more established and settled, we can start looking at going back to the music. I miss it now. I didn’t during the first year, because I think I needed a break. But now I’m starting to get itchy again.” Perhaps that’s why when the organisers of Cork Pride called John up, asking him to revive Work Out for one night only, he jumped at the chance. “I was like, ‘Just try and stop me!’ I didn’t realise people were still talking about it, to be honest. I thought they’d forgotten all about me at home. “I’m really looking forward to going back. And I’m going to play the following Saturday night in Climax too. I’ll be home to see all my girlfriends in Cork, all the queens. You can’t have the same humour and laugh over here. The Dutch are completely different. “I feel privileged that they still love Work Out in Cork. I can’t wait to do it again. I’m going to do it in rollerblades and kilt this time. I’m trying to come up with loads and loads of ideas. 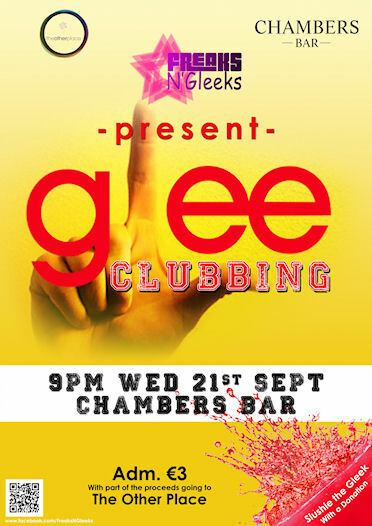 Freeks and Gleeks present a fundraising night for The Other Place on We 21st Sept. Cher Guevara joins the Freeks and Gleeks to host a night of singing, dancing and even slushie throwing. 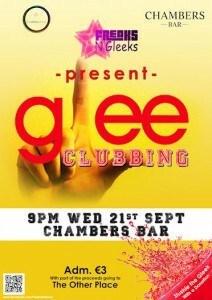 Admission €3 with extra donation needed to get your favorite freek or gleek slushied!! A great night is in store with music, drinking and dancing going on into late hours. The Cork Gay Project are having a Fundraiser Barbecue in the Bodega on Thursday September the 22nd. It costs €20 and food will be served from 7-9pm. There will also be a DJ till late. Tickets can be purchased in the Other Place, LINC, Loafers or from Clive Davis or Dave Roche. 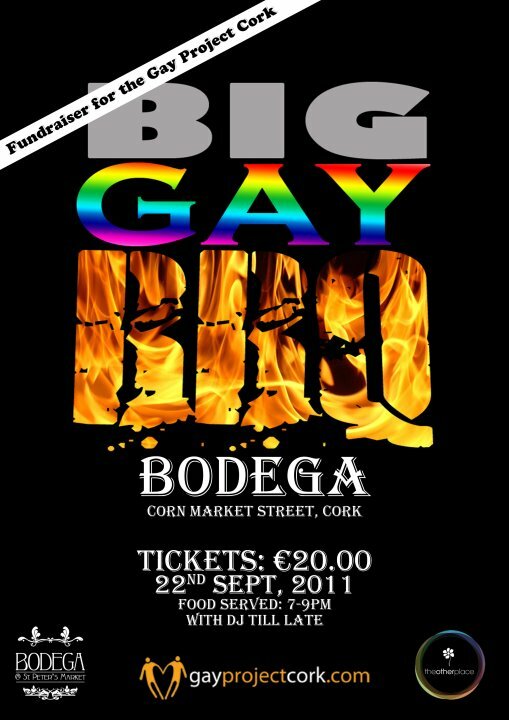 As you may or may not know the Cork Gay Project and the Other Place both do a lot of hidden work that helps the Cork LGBT community in many ways, and whilst we know there are a lot of fundraisers throughout the year, we feel that one is for a very worthy and necessary cause. Please help to support them on the night if you can. Choral Con Fusion, Cork’s LGBTS Choir, are resuming rehearsals after their summer break on Wednesday 7th Sept at 6pm in The Other Place. 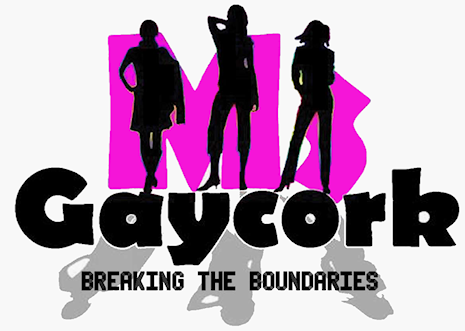 Miss Gay Cork is going to take place again this year, with the initial date has being set for Sat the 26th Of November in Chambers Bar @ 10pm. We are currently orgaising it and we hope for it to take place in Chambers on Western Road again, at 10pm on Saturday November 26th 2011 but organising is still ongoing. The winner will receive a trophy and prizes on the night. All proceeds are going to the charity Marraige Equality. We hope to get a great turn-out on the night, after all, the audience has the power to vote who they want as second Ms. Gay Cork and we hope that it will continue for years to come!!! For this year we are hoping to have three fundraisers. We are currently orgaininsing them but we hope to have a Quiz and a fun Auction in October, as well as a charity calendar for all you ladies who love ladies! If you are interested in entereing please email Kate on msgaycork1@hotmail.com, otherwise please visit their website for more info. Funk N Something are doing something different this time around with an ‘Electro House Sessions’ night at Chambers on Friday 2nd September. Doors open at 9 pm. 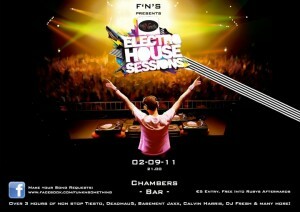 €5 plus free entry to Rubys.